New York: Peter Blum Edition. This book contains thirty-six poems by the 8th century Chinese poet Tu Fu, translated by Kenneth Rexroth. There are twenty-five duotone reproductions of “Etchings to Rexroth”, a portfolio by Brice Marden. 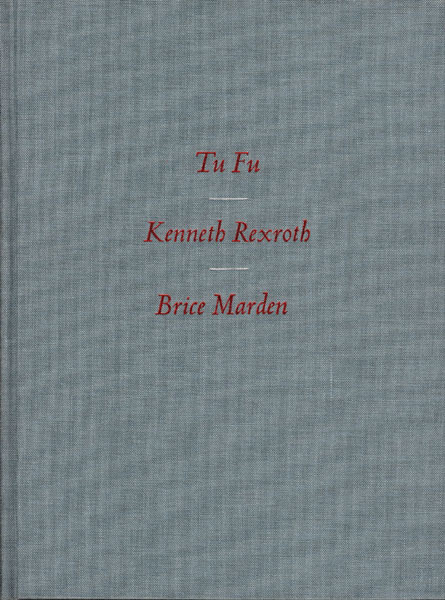 Furthermore, there are two texts: one by Bradford Marrow about Tu Fu and Kenneth Rexroth, and another by John Yau about Brice Marden. Introduction by Peter Blum. Edition of 800, 114 pages, 25 duotone reproductions, texts are in letterpress on Arches Cover and Superfine paper, cloth hardbound.